I had never really considered myself a writer. Although I had always liked writing, it had not been on my list of career choices. In 2007 when I took redundancy from DHL and set up my coaching company knowboundaries, blogging was in its infancy, and even that form of written expression seemed too scary to contemplate. So how on earth did I get my first paid writing gig? Shortly after I started my own business I decided to volunteer in the Amsterdam offices of ACCESS as a help desk volunteer. This office no longer exists, but in 2007 it was a valuable contact point for new residents in Amsterdam. The job involved taking calls and answering emails from people looking for information, and seeking help with various problems. I liked it – you never knew what the next enquiry would bring, and it was very rewarding to be of practical help to people. One day an email came through from a publishing company looking for writers to contribute to a new residents guide to Amsterdam. I passed the request on to several people, including a friend of my who was a professional writer. My friend never replied (one of the characteristics which made him a “real” writer in my eyes). But I thought about the request, and I wondered if I could meet the criteria, so I got in touch. They did not ask for proof of past work, but gave me a couple of assignments to complete by way of a pre interview. It was fun researching and writing them, and eventually I landed the job. The guide employed six writers to each do a different section, and my section was SHOPPING something I love and am good at! Be disciplined, and stick to the deadline. Self publishing is all about the money. I was bitten by the writing bug after this experience, and enthusiastically started the first of several blogs, but new paying writing jobs were thin on the ground, and although I did get a few different copywriting jobs, the explosion of the internet meant there was stiff competition from overseas. My next foray into publishing was a few years later in 2011 and again it was accidental. I had teamed up with another coach, Anne Galloway, and we developed a workshop together. It was very popular when we ran it, and we were asked to present it more than once, which was great, the only problem being the amount of content. The solution was to turn the content into a book. We looked into self-publishing and selected a few publishers – eventually picking a company we thought was UK based as their website had the “.co.uk.” tag. We had to pay for the publishing, but there was a marketing deal included and we could set the sale price of the product ourselves, which seemed to give us more autonomy over the process. The problems began as soon as we signed the contract with them. It turned out that the UK address listed on their website was just a front, and all operations were carried out in the states. It also turned out that the marketing deal was a fake, and we were pestered by phone calls in the late evening persuading us to pay more for marketing, even offering us TV slots in the USA. To add insult to injury, our royalty cheques, which were issued in sterling, had taxes deducted which we could only claim back if we filled in annual US tax returns. All in all it was a sobering experience, and a sad end to our book: or so we thought. Out of the blue I got a call from another publisher asking if I would be interested in publishing an e-book with them. Anne and I were understandably wary. We checked them out, and realized to our joy that they did not want us to pay to be published, that their philosophy was to provide free student textbooks as e-books, which were financed through advertising placed throughout the book. Their goal in contacting us was to extend their business book offering. Publishing a manuscript through them meant that we would get a percentage of this advertising revenue. We decided to give it a go with a manuscript we had been thinking about for a while, and in 2012 published our free e-book “the secrets to workshop success”. We were very happy with the way BookBoon dealt with us, and their business model too; we were even more happy when the commission payments started to come though. This time in Danish krona! In 2014 we decided to release a second e-book through Bookboon, “how to ask for what you want at work”. This business book is free to download if you take out a Bookboon premium subscription, which gives access to their whole library of business books, or you can make a small one-off payment to download this title. These two books have been downloaded over 250,000 times since 2012. But remember or sad affair with our American publishers? We decided to take that manuscript away from them (and in doing so found out that several disgruntled authors had taken out a class action against them in the States). We updated the material and BookBoon published it in April 2015 as a premium title. 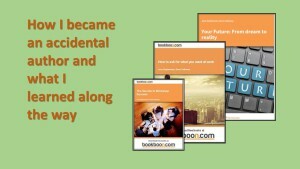 Its now available on BookBoon as “Your future – from dream to reality”. We hope this book will find the success it deserves and BookBoon really were our “knights in shining armour”. Finally, if you feel inspired to write, just go for it. And if you are lucky enough to be paid for something you love doing, take your fees in whatever currency the publishers choose to pay it in. What a great rabbit trail tale! I love that trail leads to success – quarter of a million downloads is substantive by any measure of success. Bravo! thanks Valentina, kind of you to comment.